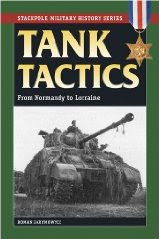 "Tank Tactics, from Normandy to Lorraine", by Roman Jarymowycz is a wonderful mix of scholastic treatise on armor doctrine and engaging battlefront stories and anecdotes. This book is about the evolution of armor doctrine among the US and Canadian forces, from the end of WWI to the trying months after the WWII Normandy landings. This is a must read for anybody interested in armored warfare. The first chapters are devoted to the post-WWI years, and all the confusion the tank brought into military doctrine. How were tanks to be used grand-tactically, as a breaktrhough ram, as an exploitation weapon or as a pursuit one? The soul-searching of the US Cavalry with their tank vs horse debate follows, with a bit less of detail as in other books by Jarymowycz but nonetheless very informative. The meat and potatoes of the book is the analysis of Operations Goodwood, Cobra, Totalize and Tractable. The author makes great emphasis in the good and bad of the doctrines of British, Canadian, US, German and (altough very briefly) Soviet forces. Every operation is put under the microscope and analyzed from the armored warfare doctrinal point of view. I would dare to say that this is the best operational analysis of the Normandy breakthrough I ever read. One word of caution: the title "Tank Tactics" is a bit off. The book makes emphasis in the grand-tactical and operational use of armor in WWII. There are a few tactical vignettes here and there. But don't expect to see too much small units tactics here. On a side note: This book has been available from Lynne-Rienner Publishers for a long time. Now Stackpole Books prints and sells it at a lower price. Kudos Stackpole for getting us this wonderful scholarly treatise at such a knockout price. Do you recognize this war game? I'm off to play these great war games.